May 15, 2014 by iCepts Technology Group, Inc.
Legacy ERP or Entry-Level accounting systems are adequate until your company grows and then there are typically limitations in accounting system functionality, data base performance, or even adding additional users, that can keep your company from growing and keep you “Boxed-In”! As your Wholesale Distribution company expands, you will notice an unacceptable delay in the menus and screen while navigating your current system. In addition, printing reports will also be painfully slow and critical business data difficult to find. 1. More Features: Microsoft Dynamics NAV has thousands more features than typical entry-level accounting systems, including: Analytical Accounting, Fixed Assets, Bank Reconciliations, Detailed Audit Trails, Multi-Currencies, Multi-Locations, Multi-Language, Multi-Companies, Flexible Accounting Periods, XBRL Support (Extensible Business Reporting Language), Recurring Journals, Payables Management, Vendor Account Management and much more! 2. Better Financial Reporting: The whole point of an Accounting System for Distribution is financial reporting. Compared to entry-level systems, Microsoft Dynamics NAV offers hundreds more reports that you can view in real-time through a integrated intranet business portal. Microsoft Dynamics NAV provides a wealth of financial reporting tools giving you flexible options for setting up a company and posting for charts of accounts, general journal, value-added tax (VAT) facilities, recurring journals, and source codes. 3. Seamless Microsoft Integration: Better and more powerful Microsoft Office Integration can help growing businesses with their business reporting. For example, by exporting data quickly into Excel, you can have a better view of business information for better company decisions. Also, Microsoft Dynamics NAV is a robust and “reporting-rich” SQL Database which enables “SQL Reporting Services”-a respected industry standard for reporting. 4. Better Compliance: Even when your Distribution Company isn’t directly affected by mandated regulations, you may be required to document compliance when doing business with companies, or in the markets, that are subject to regulations. Microsoft Dynamics NAV ERP helps support such regulations as Sarbanes-Oxley, Basel II Compliance. and others. 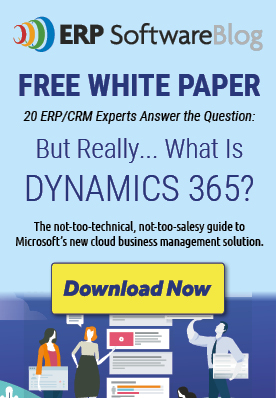 Why Choose Microsoft Dynamics NAV as a Cloud ERP Solution?